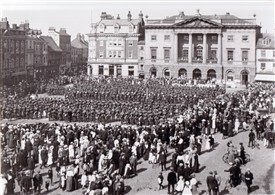 On 10th August 1914 the 8th Btn Sherwood Foresters assembled in Newark market Place, and marched off to war. 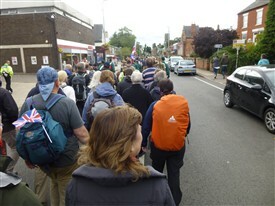 They marched from Newark to Radcliffe-on-Trent where, after an overnight stop, they marched on to Derby via Nottingham. 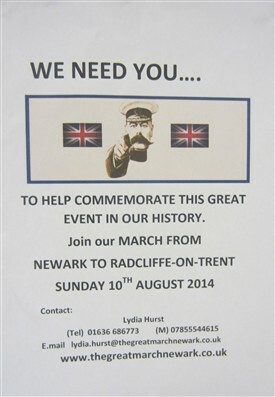 On 10th August 2014 - 100 years to the day - a band of plucky Newarkers braved an unseasonal downpour to recreate the march from Newark to Radcliffe in homage to the bravery and sacrifice of those men. 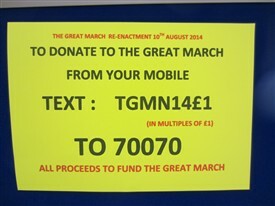 I recorded my attendance to join the Great March at 8.30am on 10th August on a day that was forecast to be atrocious weather - you always hope they are going to be wrong, this time they weren’t! The march was due to leave at 10.00am but before that we had the arrival into the market place of two World War 1 trucks and a horse drawn mobile kitchen and a short Drum Head Service. The rain started at about 9.00am, so on went the wet weather gear and up went the umbrellas. I was pleased to see a couple of familiar faces from St. Giles, Edward Casebourne and James White who were also walking. We set off on time following the Balderton Scout Band, members of the British Legion, a platoon from the Mercia Regiment and various cadets and about 70 walkers. The two trucks and mobile kitchen followed at the back. The band left us at Farndon Road and we continued our journey including the horse drawn kitchen which came with us all the way to Radcliffe! I met lots of interesting people who all had different reasons for walking, 78 year old Mr Green who was dressed in World War 1 uniform including rifle, was there because his father was one of those who left Newark on 10th August 100 years ago, a man who was walking because his grandfather had fought and he has his wallet which his grandfather kept in his top pocket, the wallet has a hole in it where the shrapnel had hit him and the wallet had in fact saved his life on that occasion. There were mixed ages, men, women and a few young people all joining together in this once in a lifetime act of remembrance. Along the way in small villages, people came out to support us; we had comments of “well done” “we’re really proud of you” which really spurred me on especially when the rain was in sheets sideways! It did make me think that those men 100 years ago would have had the same support from villagers on their way and I’m sure it would have helped them but of course many of them would never had heard “well done”. We had plenty of water stops along the way which was most welcome and meant I did not have to carry water and lots of back up from the Newark Community First Aid Unit and transport if we needed it. Half of the walkers just walked to Flintham, the rest of us carried on, it was still raining and by now we had thunder, I was very wet and I did what I normally do at times like this – I sang to myself and kept my pace. This was nothing compared to what they had endured in the trenches. The platoon of Mercia Regiment was still at the front and I had them in site all the way. We eventually arrived at Radcliffe early, so we all had an hour at the pub; tea and coffee were being served as well of course. The band then rejoined us and we again marched to our final destination, when the band played ‘Pack up your troubles and ‘It’s a long way to Tipperary’ we all quietly sang till we reached the Church for our Drum Service and “Fall Out”. I had a fantastic day, I will probably never do anything like that again and it was a wonderful way to commemorate those who went to war 100 years ago from our local area. We were all presented with a medal which was a lovely surprise and a memory to treasure. A huge thank you to those who organised it. Over 700 men from Newark and surrounding villages answered the 'Call to Arms' during the Great War.